It’s probably a little late to do this review but seeing as I did one for B.A.P and they are one of the most popular boy bands, I figured I should do one for MAMA too ( It’s not too late if they are still promoting their first single right?) Anyway, on another note, i have read quite a few reviews on Exo-k’s first mini album and i must say that even though it’s right (i’m not sure if that’s the right word to use), but i think that i want to do this review without going on and on about SM (will do my best). After all, this is Exo-k’s album review, not SMentertainment review! This song differs from other songs with its georgian chant (thingy) at the beginning and not to mention a screamo portion. Something i haven’t heard before in (recent) kpop songs is D.O’s part at the beginning where he sings through all the notes (what i mean is if you look at the guitar, it’s like plucking one string and running your finger down the neck of the guitar on that string which means you just played through all the notes in one beat). The heavy strings riffs create the atmosphere of a rather dark one which is quite suited to the theme of the song, which is the darker side of society. The beat of the song is strong, matching the heavy strings riff (which i like a lot because i prefer the lower strings: cello instead of violin). The style (and overall feel) the boys sing in adapts to the song very well too. Not to mention that the screamo part is actually quite well planned out in terms of the volume in comparison to the music and the part of the song it was placed at. (they even do harmonising during the chorus) Frankly speaking, this is a better song than most people give it credit for. I was attracted to it after the first listen and still am now (after listening to it for a good few hundred times). Their first prologue song, or more like D.O’s and Baek Hyun’s teaser. The music itself isn’t anything complex, the thing that really gives the melody -and life- of the song is really the vocals (hooray for D.O and Baek Hyun for the good job). At the same time, this song is apt in showcasing the vocal talents of both members without needing them to overdo it. On first listen, if you weren’t paying attention, it’s a little difficult to differentiate their voices from each other, but after a few listens, Baek Hyun’s voice is a tad rougher than D.O (if that’s the right word; but you get what i mean). They do still sound like one when they sing together. Overall, this song itself is beautiful, but i’m not sure about it being placed right after MAMA. Straight after is their 2nd prologue, where all the members actually take part in. Musically, this song doesn’t stand out that much from other kpop songs. (thankfully it’s just a prologue). i’m thinking this song’s purpose is to be catchy (to catch our hearts? haha). What with parts like “every, every, everyday” and “oh-oh oh-oh”. This song also rely a lot on it’s strong beats rather than melody, throw in all those little hooks, and you have a nice catchy song. Well, as a prologue, i guess it’s good enough. After all, they have to make sure the prologue doesn’t overshadow their debut single. Oh gawd, i loved this song the moment i heard it (during their showcase). How can anyone not? It’s so easy on the ears and the feeling of sweetness just overcomes you, what with the sweet melody of the piano. What i found interesting at the beginning was the way Baek Hyun (i think) sung off-beat. And Su Ho sounded like a angel (so suited to the song) when he sung his first part (it was so light and echo-y). 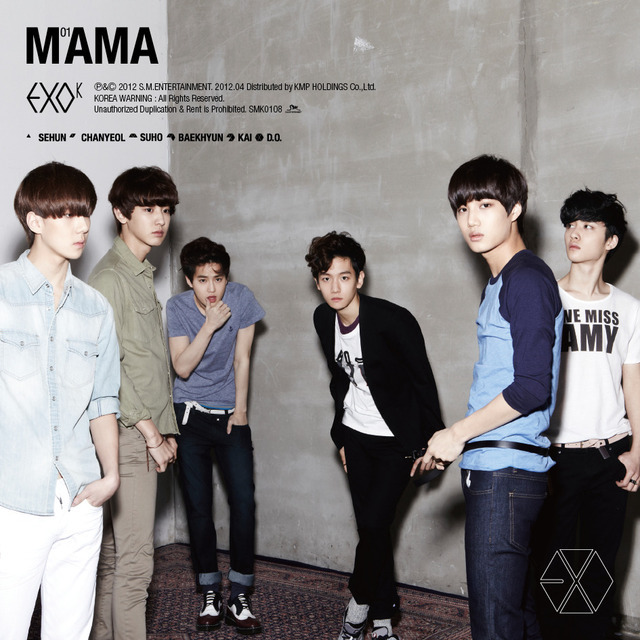 This song gives off such an innocent feeling that is suited to Exo-k as rookies that fans can’t help but love this song. This song kind of caught me of guard because it sounds so much more like an english hip hop song than something i would hear in a kpop album. But thanks to this song, fans have come to really notice (and love) Chan Yeol’s deep voice (which is not what you would expect from the kind of face he has). Unfortunately, with Kai’s and Chan Yeol’s deeper voice, Se Hun’s slightly higher pitched voice gets lost in this rap-based song. At first i thought this song was kind of awkward but after listening it to a few more times, you get used to it and it doesn’t seem as out of place as it seemed. This song does seem like a teaser for the rappers like how What is love was for the lead singers. For this song, i CANNOT help but to mention at least Shinee because gawd does this song scream Shinee so much it took me ages (about 2 weeks or so?) to be able to realise straight away that it is an Exo-k song and not Shinee’s every time my ipod shuffles into this song, before it finally begin to differentiate itself. ( ok that’s the only thing i’m going to say about anything not Exo-k) I think this is one of those song where the title of the song really matches the song. True to it’s title, when you hear the song you immediately get a mechanical feeling song (not in a bad way). The boys inject a kind of mechanical feel into their singing helped by the mechanical feel of the background music (it’s as if the music is created with mechanical sounds, you don’t hear any normal percussion or musical instruments) with it’s little machine beeps and what-nots. The chorus becomes a bit more smooth and less machine-like. We also get a glimpse of some Two Moons feel rap. Individually, i hardly think most of the songs in their mini-album can be deemed as lousy. However, as a whole, the album seems to be more experimental. In this album, we got so many different styles thrown at us it doesn’t feel anything like an ‘album’ per say. Most of the songs, besides History and MAMA and maybe Machine got me wondering how they can perform any of the other songs live without either leaving out the rappers or vocalists. Well, i hope that their second single/ promotional song wouldn’t be something from this mini-album because as far as i can tell (or listen), none of these songs should be used if they want to even out the screen time of all the members. Besides that, i personally thing the arrangement of the track list is… a bit messy. It was like fast song, slow song, fast song, slow song. It highlights even more the experimental value of the album. My conclusion: Listen to all the songs on Shuffle with other songs and not as an album.